Continuing on the left, from Connor's Lane, Connors were dealers in coal, milk and farm produce, had some land, and let cars for hire, and had an: adjoining house as a registered lodging house, 3d. a night for bed and the use of fire for cooking meals, which the lodger supplied. Next, Larry McKenna, the local barber, a great story teller, ghost stories, fairy lore, etc., which entertained the customers during the haircut or shave, while the wife smoked her clay pipe beside the 'ire. The barber's fees sometimes were not enough to keep Larry and the wife in drinks, etc., so he had a mysterious small tin trunk which he carried off out the country and he peddled odds and ends -laces, studs, pins, etc., etc., to swell his income. Next door was Kellys, whose father was a merchant sailor who came home at intervals from long voyages. He had a nice family of girls, teachers and nurses, and his widow opened a shop on the opposite side of the street when he died. Hoiards were in this house after Kellys. Next house, before 190. ), was occupied by a family, NcEvoys, who were nail makers. They had a forge behind the house, and made cut nails for boarding floors and other heavy carpentry work. The nails were made by hand from long strips of metal. When machine made nails were introduced this business ceased. The old nailer and his three sons did a good trade at this business in his hay day. This house was later occupied by one Policeman after another. Next house, Bolgers, tailor. A dignified old man who always wore a tall hat, and black frock coat. When the threshing mill came with steam engine and mill wagon, -it was an hour of excitement to navigate the bend in Earley Lane, and the team of 20 or 30 threshing workmen would help to push and steer the two cumbersome vehicles around the narrow crooked bend, and old Glasgow, the publican, would be out watching that the engine didn't colide with his gable end wall. There were hay barns and back yards in the Wretch Earley's farm buildings, where we had many happy childhood days, and he would get us to help with the hay and the corn, and gave us rides to his fields in the big cart in return. The big Earleys were more exclusive and as a great treat we would steal in to see the threshing, and catch .mice in the corn ricks as they were being thrown down to the mill. Peter Earley's house was on the other corner of the lane and his wife Hag sold milk to local customers. Next to Peter Earley (small farmer) was Paddy Coleman, tailor. Earley's Hotel came next. It was more a pub than a hotel but an odd traveller stayed there. Peter Earley had a large family, five daughters and five sons. His sons all became banisters or solicitors, except one kept on the farm. They had a beautiful compact farm on the Malahide Road, but it passed out of the family in later years. The Post Office came next - Matthew Keane, Postmaster, ex. sergeant, R.I.C. Before Keanes came there, there was a Mrs. Maguire, and the Post Office was at the end of the town. The Mill on Bridge Street was owned by several people over the years. It was originally owned by Terence O'Neill. 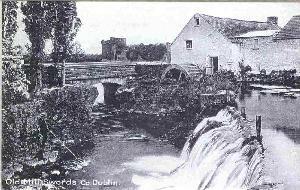 The Mill was used to ground corn and oats with it's power coming from the Ward [ Jacko ] River. The working life of the Mill ceased around the early 1940's . The Mill house was dismantled in 1953. Soon after that Paddy Pentony build a large workshop where he sold farm machinery from. This workshop was knocked down to make way for The Castle Shopping Centre.